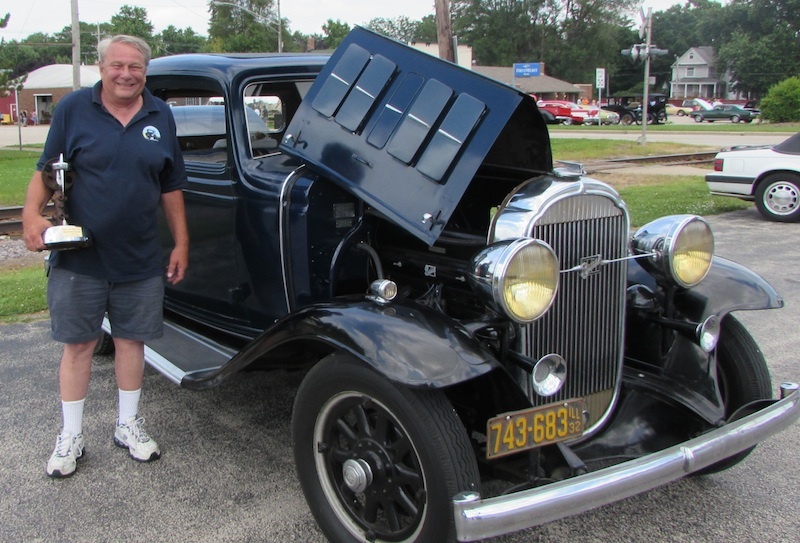 A 1946 Chevy pickup belonging to John Archacki of Harmony captured Best of Show honors at the third annual Heritage Fair Car Show July 12 in Union. Archacki said he has owned the two-toned pickup eight years. He came across it in the Genoa-Kingston area of DeKalb County. Bill Seemann of Union also was singled out for his Buick coupe, which sold for $800 back in 1932. Bill bought it from a Gillett, Wis. museum. He repaired the seized motor but has not changed anything else. No wonder the car won top "survivor" honors from among a handful of strong contenders. Other winners were: Penny Stynoski, Hampshire - 1924 Model T; Carol and Jerry Horner, Union - 1955 Speedster; Terry Stinger, Wonder Lake - 1969 Nova; Karl Nielsen, Woodstock - 1940 Dodge pickup; Jim Klein, Woodstock - 1955 Ford F-100; Bob Newman, Woodstock - 1958 Pontiac Bonneville; Bill Montonye, Huntley - 1967 Chevy Chevelle; Louie Doty, Huntley - 1936 Ford Coupe; Karin and Darryl McIntosh, Marengo – 1969 AMC AMX; Ron Kusk, Hampshire - 1968 Camaro; Dennis Ball, Huntley - 1966 Chevy Chevelle; Roger and Kathy Porep, Woodstock - 1955 Pontiac Safari station wagon; Art Maercken, Maple Park - 1956 Oldsmobile 588; Gerry McMahon, Huntley; Len Spencer, Wonder Lake - 1957 Chevy Bel-Air; Joe Pieroni, Woodstock - 1954 Bel-Air; Bill Seeley, Crystal Lake - 1965 Oldsmobile Cutless; Nick Smith, Union - 1968 Dodger Charger coupe; Jeff Horre, Woodstock - 1959 Studebaker Silver Hawk. Special thanks to our major sponsors, Intren and FirstMerit Bank Union.